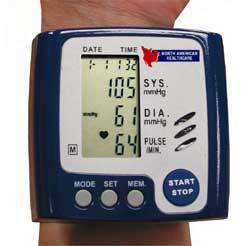 Now taking your blood pressure is as easy as 1-2-3! Just wrap the cuff around your wrist and push the button. Automatically, the wristband inflates to the proper pressure, and the monitor calls out your systolic and diastolic pressures, as well as your pulse in a clear voice. Features a memory recall button allowing you to save up to 99 previous readings with date and time so you can track your health at home. Includes a case for storage. .